One advantage Windows 7 has over OS X is that you can stream to your Xbox 360 without the need for third-party software. And though it's still rough around the edges, it mostly functions. For those unaware, there are two ways you can stream media to your Xbox: through media center or through your windows media player library. Media Center gives you the advantage of a visually-oriented UI and some advanced features such as live TV and movie rentals. Streaming through the Media Player library, conversely, is an easy, no nonsense way of accessing music and videos. The problem is, getting everything setup isn't such a breeze. Let's start with Media Center. In theory, you should be able to start Media Center on the Xbox it will already have a prompt to initiate the setup process (If you already have another MC computer up and running, you can go into the Computer menu under System Settings) In theory, it should offer an eight digit number, which you then plug into the setup screen on the desktop Media Center client, and the rest is taken care of. This worked the first time, but because the UI on the Xbox media center was painstakingly laggy, I attempted to unlink the Xbox and PC, and try the setup again. A handful of failed configurations took place, and I ultimately had to make sure no trace of previous MC setup attempts were present on either the Xbox or the PC, then clear the Xbox Cache. After that, it managed to setup OK, but kept saying the bandwidth was extremely low, when it was actually fine. And even after setting it up again, the Xbox Media Center App is really, really slow to navigate over wi-fi. Apparently, according to Microsoft, the beta version of Media Center streams better with your computer hooked up to Ethernet. They say this will not be a problem in the final version, but for now, it is what it is. Music playback is pretty smooth as it picks up anything in your library, and provides a bright quilt of album art to view in the background while a song plays. Videos show up in your video library, and playback, though there seems to be some freezing, and difficulty with playback controls. The new Play To feature, which uses Windows Media Player on your PC as a remote control also worked well inside Media Center (we'll have more on this feature soon). 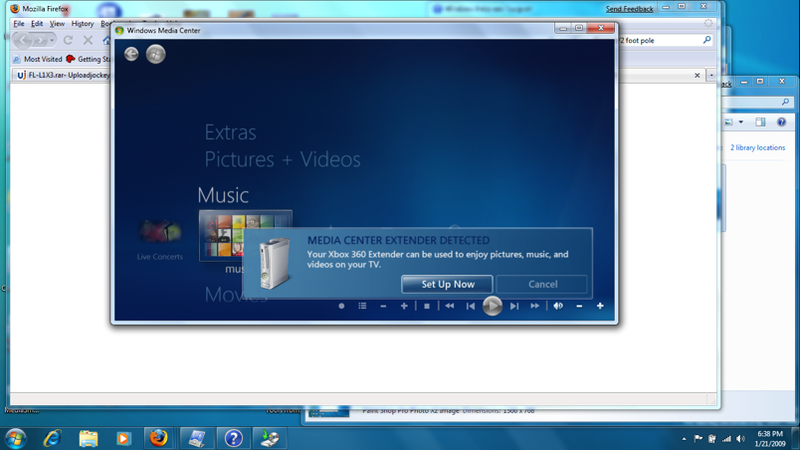 As for accessing your files through the Windows Media Player Library, it's as easy to set up as it was on Vista. Except now, all you have to do is go into Windows Media Player, click the Share in the menu bar, and select the share media option up at the top. A box should pop up with a one-click option to enable media sharing, and all the music and videos in your Media Player library should be available to stream via the Video and Music library options in the Xbox interface. The only problem is that video seems to be finicky. Windows friendly formats, such as WMV, seem to work best, while AVI files tend to have problems. The Media Center team at Microsoft says that the beta version of Media Center isn't handling third party video formats particularly well, especially DivX and Xvid, but they expect to work the kinks out on that soon. Wilson has been able to get a couple of AVI files streaming properly using the above steps, but Jason and I have not, and the video folder registering as empty. In any case, it may not be perfect yet, but with a bit of tinkering, you can get Xbox streaming working with Win 7.